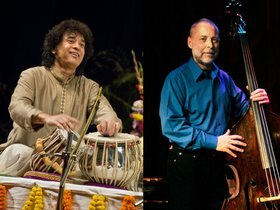 The Chan Centre for the Performing Arts at UBC welcomes Zakir Hussain and Dave Holland in Crosscurrents, Saturday, October 28, 2017 at 8pm in the Chan Shun Concert Hall. Hussain, the world’s foremost tabla master, and Holland, an all-star bandleader, composer, and 2017 NEA Jazz Master bassist, unite to explore the shared influences and intersections between jazz and Indian music. Performing alongside a stellar quintet—including New York’s illustrious saxophonist Chris Potter and renowned Bollywood film composer and vocalist Shankar Mahadevan—these virtuosos will bridge two styles seemingly worlds apart in one brilliant collaboration.